Everybody loves ice cream no matter whether it's summer or winter. As far as January 15 is National Strawberry Ice Cream Day, it's a great reason to indulge yourself in this sweet and tasty dessert. 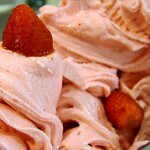 Strawberry ice cream is made by adding strawberries or strawberry flavoring to sugar, eggs, cream and vanilla. Pink or light red hue is achieved by adding some food coloring. The origin of National Strawberry Ice Cream Day is unknown, as well as of the most food holidays. The first mentions of ice cream are dated to 3000 BC, when people in China served sweet juice mixed with snow or ice. But cream that we all love is believed to be used in the early 1800s. There are hundreds of different flavors used for making ice cream. Despite such diversity only three of them became standard: chocolate, vanilla and strawberry. All three flavors can be found in one dessert that is called Neapolitan ice cream. This dessert is made up of three ice cream scoops that are served together in one block. The dessert is very simple, but it tastes great!